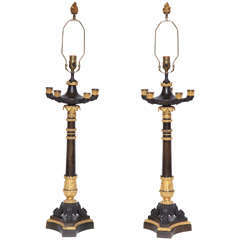 French Empire period, pair of chiseled ormolu candlesticks, converted in table lamps An exciting and gorgeous pair of French Empire period gilt bronze candlesticks, finely chiseled of vineyard, flowers, palmettes and Horn of plenty. 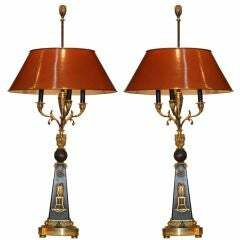 Our candlesticks converted to table lamps, with new French pleated yellow silk lamp shades. 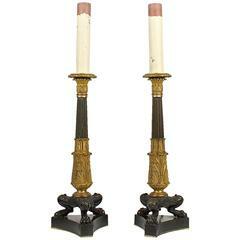 Beautiful French work early 19th century, Empire period, circa 1805-1810. 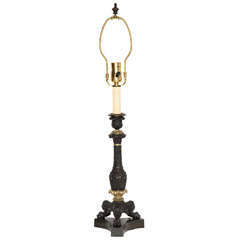 Dimensions: Candlestick without lampshade height 11.41 In. Candlestick with lampshade height 20.07 in. - Diameter lampshade 11.02 in. The candlesticks professionally wired for electricity. Overall good condition with minor wear to gilded surfaces. Silk lampshades are new. The candlesticks professionally wired for electricity. Overall good condition with minor wear to gilded surfaces. Silk lampshades are new.